Younger generations of hip hop artists are increasingly questioning the use of the “N” word. You know the word. THAT word. Possibly the most emotionally charged word in the English language. The word that stands for centuries of society unfixed. Not a pretty subject. I’m loud and proud about freedom of expression in the arts and also run several hip hop forums. But just because you CAN express something does it mean you SHOULD? It’s an issue, and a good one for up and coming hip hop artists to give serious consideration to. If you don’t listen to hip hop, let me fill you in on a couple things: The “N” word is everywhere in it. You can say what you want but it doesn’t change the facts, hip hop IS music (in fact it’s very good). It is currently the most active leading edge form of expression for teens. It’s here to stay. Remember the people in the sixties that said the Beatles were rubbish and rock was a fad? If you say that about hip hop today then you will eventually join those ranks. I’ve heard the word a lot in two venues with two very different connotations. I played Country music for many years in nightclubs when I was younger. Not too often, but every once in a while, I would hear the word. Usually as part of a joke, but every once in a while said to me as if I was part of the inside crowd that appreciated it. I wore a cowboy hat, so I guess the stereotype fit. It always took me a little offguard, like why would they say that word? The other place I used to hear it a lot was when producing hip hop music (I’ve produced several hundred hip hop demos and soundtracks, which is a little confusing to those that know me from orchestral and sacred projects). It was very rare that a rap artist did NOT use the word in a rap. It was really the expected thing. Every once in a while I’d get a rapper who told me they refused to use the word, but those artists were few and far between. Times have changed. I think originally the word was overused in the context of comraderie as a way of de-sensitizing it’s history. “Yo my N***” was affectionate when said by the right person TO the right person. Social consciousness undergoes a paradigm shift when a whole strata of society changes it’s view on something. An example is the current social consciousness about smoking; very different than it was in 1960. Or even drinking, as a society our overall view has changed. The tipping point of these things is a mystery, but one day we wake up and it seems the world has changed. So it is with our increasingly elevated race consciousness and the “N” word. The arts, rap music, was one of the places the word was cool. A slow change has occured and artists are increasingly evaluating their use of the word. In 2006 when comedian Michael Richards went on his racist rant at the Comedy Club in Los Angeles, he inadvertantly opened a lot of discussions. I saw one interview with another comedian who’s schtick was built largely on using the word, and he announced he was cutting it from his act. He was asked if he would still be funny without it, his response was that he really didn’t care. He was doing his part to do what he thought was right. I’ve run a hip hop forum since 2000 who’s membership is largely urban youth age 12-19. They’re talking about it now, whether it’s ok to use the word. That’s the reason I’m writing this post. It was never a discussion before, it was just the thing to do. But somewhere the tipping point has turned and even inner-city urban youth are questioning the effects of the word. Many people accept that the arts are a way of expressing the human condition. If the race consciousness has changed to finally make this word obsolete after hundreds of years, then artists might consider that fact when creating new works. My experience has been that younger artists use the word not fully realizing it’s implications. Increased education and exposure to the struggles that have gone on during the Civil Rights movements has a tendency to dull the charm of the word for many artists. This is an artist that really stirs my imagination. 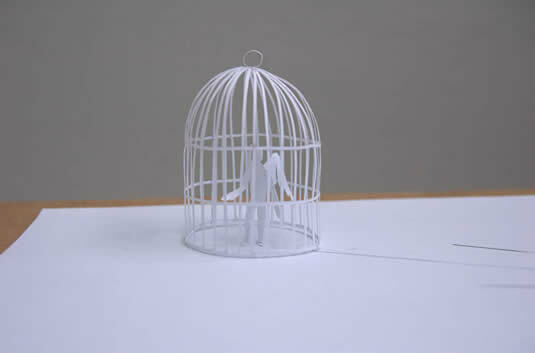 Meet Peter Callesen from the Oncotton Design Studio in London, England. 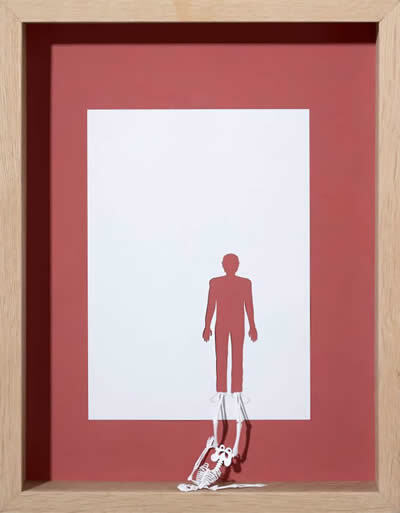 See more of Peter Callesen’s artwork from his online gallery. Seems he is picking up a bit on the groundwork laid by M.C. Escher. I’ve never met anyone who didn’t absolutely love Escher drawings. Around my college years a friend gave me the book Godel, Escher, Bach – which the author describes in his own words: “I realized that to me, GÃ¶del and Escher and Bach were only shadows cast in different directions by some central solid essence. I tried to reconstruct the central object, and came up with this book.” If you like mathematical relationships, music theory and how the two related – I think you’ll love the book. 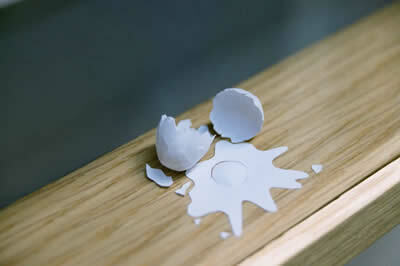 So Peter Callesen’s work excites me because I get the same sense of wonder with his work that I do with Escher. A kind of giddyness at the ridiculous nature of the work, and immediately following a deep respect for the complexity underneath a deceivingly simple presentation. A skeleton contemplates it’s relationship and seperation from the body; has it had enough of the tired shell and desires it’s own identity? Then I realize it’s a piece of paper, and I laugh at all that I am trying to read into it. Great work Peter – you are a true artist.Â Your works make our minds dance and think, and with no bitter after taste. I predict one of his works will one day be in the Louvre. Maybe someday we’ll get to do a join art-music venture. That would be a blast! A common theme in many of my works earlier works is a reinterpretation of classical fairytales as well as a more general interest in memory in connection to childhood – as for instance in my performances Castle, Folding and Jukebox. These playful performances exist in the lost land of childhood, between dream and reality, and It is in this meeting or confrontation of these two conditions, in a kind of utopian embodiment, that these works of art becomes alive, often in a tragicomic way. This interest for the romantic is extended in my later exhibitions White Shadows at Esbjerg Art Museum and From dust to dusk, but here with less focus on the confrontation between dream and reality leaving more space for the poetic aspect as well as the possibility of a reality behind or within the dream. Lately I have been working almost only with white paper in different objects, paper cut, installations and performances. Some of these objects and installations are copies of stairs and ladders made out of thin paper. These works derive from my earlier work, Bridge and Still life, dealing with dreams and the impossible – but here in a more fragile and almost sublime version. The trashy style in earlier works is here exchanged with a more precise aesthetics. The work exists in the gab between the recognizable everyday object and the fragile and spherical condition and material in which it appears. The whiteness, the ideal pure copy of something real as well as the vertical direction coherent in most of my paper works, could also indicate the aspect of something platonic or religious. 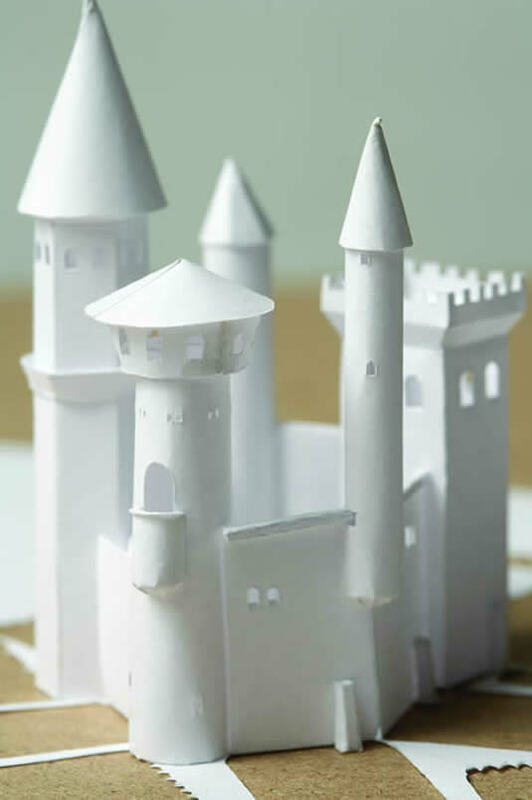 Most recent I have started to make white paper cuts/sculptures inspired by fairytales and romanticism exploring the relationship between two and three dimensionality, between image and reality. 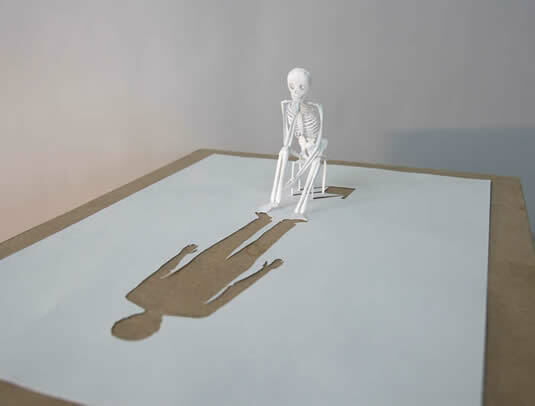 I find the materialization of a flat piece of paper into a 3D form as an almost magic process – or maybe one could call it obvious magic, because the process is obvious and the figures still stick to their origin, without the possibility of escaping. In that sense there is as well an aspect of something tragic in most of the cuts. A continual figure in my earlier performances and later drawings is The Dying Swan, who can be described as a hybrid between The Ugly Duckling and a human figure. The Dying Swan reveals different layers of identities, and often he strives for being somebody or somewhere else or tries to achieve the impossible – but is always confronted with reality and failure. He is not only a symbolic character. In his interaction and power-play with the audience his physical presence often creates an intense and uncomfortable atmosphere. In the drawings The Dying Swan creates his own universe, where he seems to be trapped in impossible situations and circles, dealing with death, rebirth, self-creation, and -destruction. Take a piece of A4 paper, just a normal ordinary blank one as it comes out of the copy machine tray. You can write on it, draw on it, but also cut into it. Peter Callesen does so. Since 2004 parallel to his performance practice, he has been transforming two dimensional surfaces into three dimensional sculptures by the means of a paper cutter. From the white surface of ordinary A4 paper, a narrative arises. Or rather, lots of them. Stories, dramas, film clips. 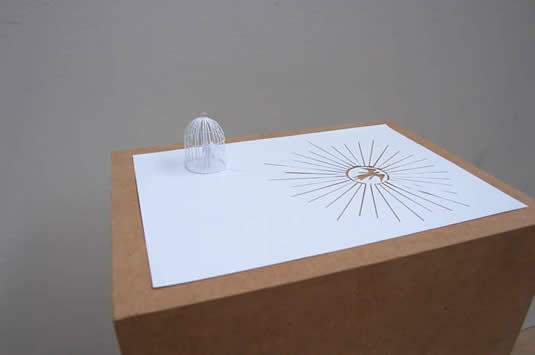 In â€˜Snowballsâ€™ a small house is erected from the paper. In the background, up the hill, two balls of snow have been set into motion. It is only a matter of time before the house will be smashed to the ground by the force of the rolling balls. At least, this is what I imagine, as the small sheet-like paper sculpture only shows the seconds before the disaster. 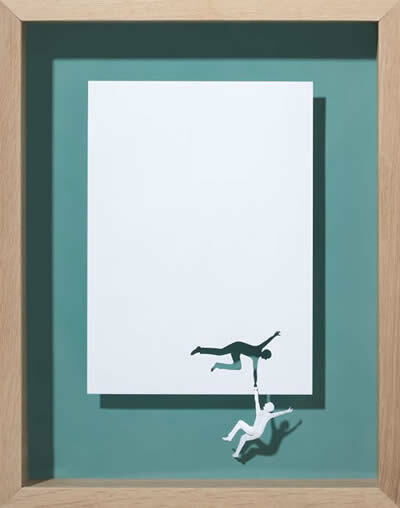 As a still image, a frozen moment in time full of classic suspense, it shows how a possible catastrophe will take place on the A4 paper, elegantly created by a few cuts and slices. 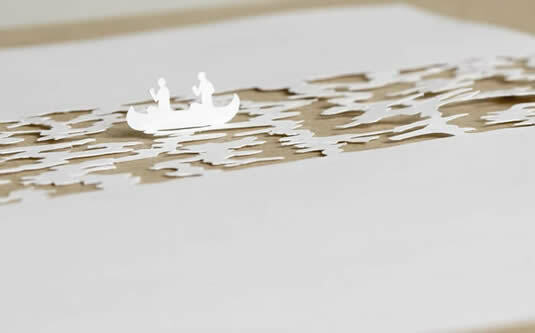 Other paper cutouts are more intricate, revealing a painstaking craftsmanship. With great care and immense patience, Callesen creates a white, hyper-aesthetic universe of puns-in-paper, often making use of a tragic-comic slap-stick humour with a melancholic tinge. Creating the paper cutouts is basic magic in a way. In stead of drawing, Callesen cuts, folds and suddenly a world appears. 2D becomes 3D, which is quite a heroic gesture in and by itself. A gesture of basic transformation you might call it, initiated by the artist/creator. However, and this is an important point to bear in mind, if the gesture is heroic, the outcome is equally fragile. Much can be said about fragility as a formal strategy in artistic practices. In an art historical context, it can be seen as a counter-aesthetical move against traditional modernist sculptural practice, most often based, as it is, on volume, monumentality, the trace of manual force or industrial heaviness. Callesenâ€™s sculptures are neither heavy, nor monumental. Rather, through their delicate materiality, their flagrant fragility evokes an â€˜aesthetic of possible failureâ€™, as if they are always on the verge of collapsing, of falling apart or being flattened by an awkward hand. In this way Callesen reformulates sculptural practise, querying as well as queering in a way, the monumentality of the medium. In â€˜Impenetrable Castleâ€™ the castle reappears. 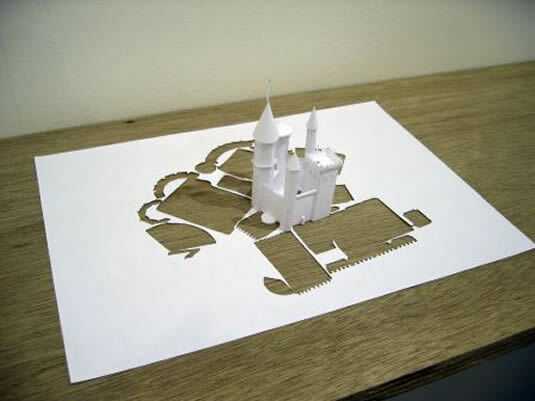 Typical of Callesenâ€™s paper cutouts, it is attached to its own negative, the paper from which it is cut. When cutting, Callesen never isolates the figure from the ground, but merely transforms ground into figure. Hence the castle remains a sculptural loop, a self-sufficient construction that cannot be entered as it closes itself off from the outside. As such it can be regarded as an emblem of both longing and enclosure, of â€œbitter melancholy, solitude, the sufferings of exile, the sense of alienationâ€ to quote Berlin one more time. A closed-off world of fairytales and childhood dreams. This connectedness of figure and ground can be seen as a merely formal matter: as the artistâ€™s way to stage a battle between the flatness of the paper and the volume of the figure, hence creating a certain formal tension between the flat sheet and the elevated sculptural form. 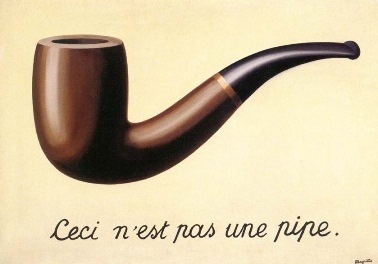 Perceived more symbolically, the connectedness of figure and ground seems to propose the inevitability of origin, meaning the impossibility of ever freeing oneself from the past. Like the figure, we are always bound to our grounding, literally speaking the A4 paper, metaphorically the place we come from. For even though the figure rises from the paper, it is equally restricted by the paper, defined as it is by what makes it possible. The paper cutout â€˜Butterflies trying to escape their drawingâ€™ makes this point very clearl: eight butterflies flapping their wings, albeit aimlessly, as they are tied to the material that brings them into being.